KEEPS FOODS FRESH - Layer ice at the bottom of the container to keep food cool and fresh for hours. 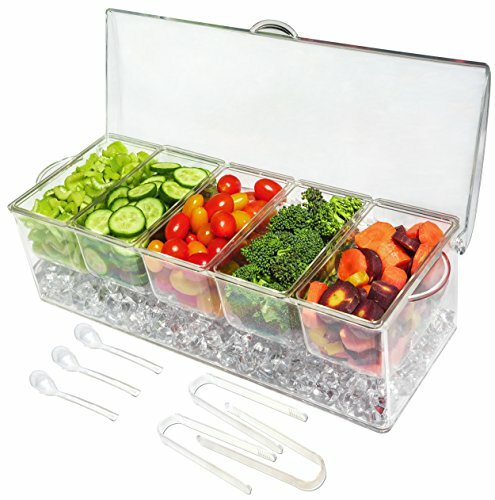 Perfect for condiments, fruits, salads, dressings/sauces, garnish and much more. GREAT SIZE - Each removable compartment holds 2 cups of food to minimize the need to refill. TONGS AND SPOONS - Three tongs and three small serving spoons are included to match the Ice Chilled Server for convenience. VERSATILE - Use it for many occasions. If you are having an outdoor BBQ, at the beach, picnicking or tailgating you will love the spacious hinged lid that helps keep your food clean. The chic clear PBA-free acrylic design elegantly fits into any decor for your indoor parties. SATISFACTION GUARANTEED - Providing quality products and customer satisfaction is our priority. Love it or return it for a refund. The Condiment Server is packaged in a strong cardboard carton to ensure 99% breakage free delivery. In the rare event there is a problem with the product, please contact us so that we may resolve the problem promptly. If you have any questions about this product by Elegant Events, contact us by completing and submitting the form below. If you are looking for a specif part number, please include it with your message.